As is typical, there are cross-currents within economic trends; economic outcomes are not exactly obvious. However, if one were bullish on the economy (and bearish on Treasury bonds), the inflation-linked (TIPS) market seems to be the most attractive place for further analysis. Although it has bounced upward recently (as seen in the chart above), the 10-year breakeven (link to primer) remains near non-crisis lows. With oil prices having already corrected hard, downside risks appear relatively contained. It must be kept in mind that my comments here are conditional, and this is not an investment recommendation. 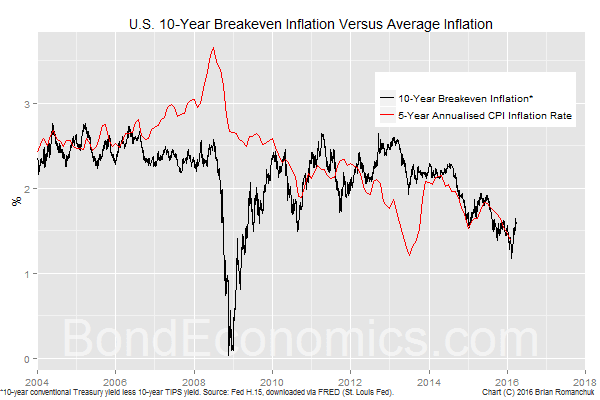 If the financial markets are once again disrupted -- which still appears possible -- the breakeven inflation rate could once again plunge as deflation fears run amok. (Although it seems unlikely that market participants will be as heavily offside as they were in 2008, which drove the spectacular plunge in breakeven inflation then.) These observations are aimed at either those with a pre-existing bond-bearish disposition, or those who are looking for directional cross-hedges. Conditional analysis like this is a vey good exercise. Otherwise, one can have the tendency to just dig into analysis that you agree with ("confirmation bias"), which then leaves one open to be blind-sided by developments that are inconsistent with your view. The article "Are Long-Term Inflation Expectations Declining? Not So Fast, Says Atlanta Fed" published in January garnered a fair amount of attention. It sets forth the received wisdom in central banking circles -- we can decompose breakeven inflation into risk premia and "true" inflation expectations using affine term structure models, and that the fall in breakevens is the result of changing risk premia, and not falling inflation expectations. I do not wish to delve into a longer discussion of this topic at this point. I would just point out that central bankers have calibrated models that rather conveniently ascribe nearly all the volatility in breakeven inflation to risk premia, which makes it appear that inflation expectations are extremely stable. (Which the central bankers take credit for, naturally.) For those of who remember that one of the alleged advantages of the issuance of inflation-linked bonds was that central banks would get a read on market inflation expectations, the fact that the current "best practice" is to throw out most of the information contained in market prices is somewhat amusing. If you are a market participant, you break even on a "breakeven" trade if the realised inflation rate matches the inflation breakeven rate (modulo technical details worth a handful of basis points). Without decades of historical data, musing about risk premia is broadly irrelevant for your analysis. The collapse in oil prices was a major contributor to weak inflation prints recently. Admittedly, there is apparently a lot of oil still in storage, so it may be premature to say that oil has bottomed. 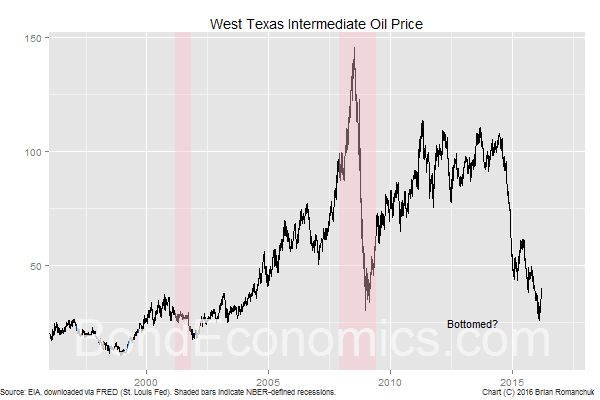 However, it is hard to see further falls in price being anything other than marginal at this point; a low price scenario would likely involve oil remaining stuck near current levels for an extended period. That would be disastrous if you are a hike cost oil producer, but it would no longer deflating prices for consumers. Meanwhile, given the trends in headline risk in the Middle East, one could easily imagine scenarios that send oil prices north of $100/barrel once again. In other words, a position that pays off if oil price rises looks like an option on geopolitical mayhem. Although I believe that the U.S. labour market is a long way from "overheating," wages have returned to the top end of the range they have been in this cycle. 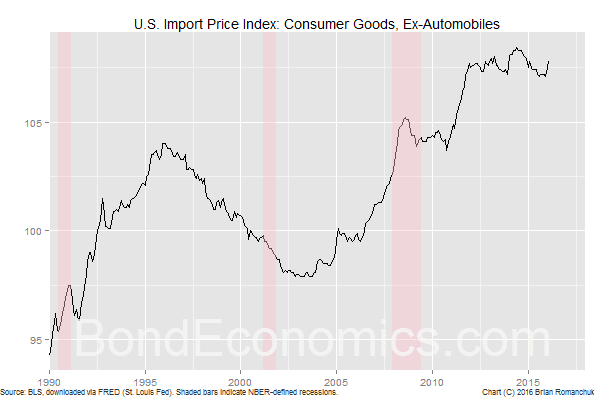 (Admittedly, that is near the bottom end of the range over the period before the financial crisis.) 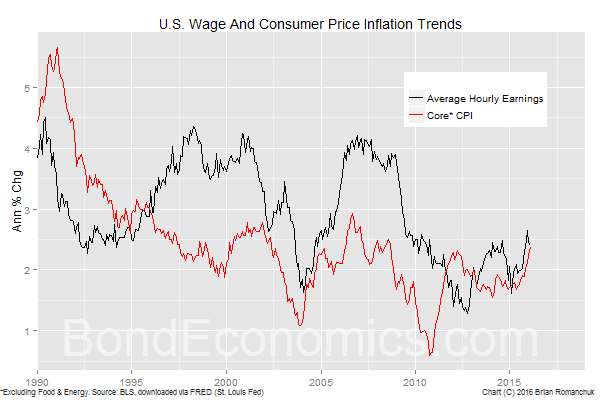 That is, there is no sign of further disinflation pressure, and if the economy continues to grow, wages will presumably tick up further. Why Not Short Nominal Treasurys? Despite the greatest economic crisis in the United States since the Great Depression, and the extremely sluggish recovery, the core CPI inflation rates was only able to sneak below 1% for a short period. With breakevens starting at a depressed level already, the downside seems manageable. On the other hand, with other central banks already dipping their toes into negative interest rates, the Fed would likely follow the herd if the economy rolls over once again. With the zero bound for the policy rate suspended, it is no longer clear what the lower limit for nominal Treasury yields is. From my "the glass is half empty" perspective, I find it hard to get excited about the outlook in either direction. The sectoral recession in commodities and manufacturing is being offset by the service sector, and the automatic stabilisers are keeping the economy stumbling along at a slow pace. This mixed outlook may allow bonds to keep trading in a broad range.